Have you heard of Land's End ? Up until a few weeks ago, I hadn't. I came across them on Twitter tweeting about the great offers they had going on and popped over to have a look around. They have a huge range of coats for men,women and children. Shoes, Boots and Sleepwear too. I was kindly given the opportunity to review one of their women's coats which I happily agreed to do. I was given free reign on their site and allowed to choose any coat I liked. It was such a hard choice though as there was just too many gorgeous coats to choose from. With the weather getting colder and winter now upon us, I was in need of a good warm, winter coat. I have lots of old coats that I wear out and about so I opted for something a lot more stylish. After a good hour looking I finally decided to choose their lovely Women's Regular Luxe Wool Pea Coat . It's a little piece of affordable luxury at a retail price of £120. It might sound a lot but you do get great quality for your money. First off it arrived in a fantastic gift box, beautifully wrapped. It was a real joy to open it. It's Woven in Italy and brushed for a luxuriously soft hand. It has Princess seams to provide shape and Neat pick stitching detail throughout. It has a Button tab on sleeve and a very decorative belt in the back. It's beautifully Fully lined for both neatness and comfort. You'll also be happy to know that it has a Temperature rating: Warmer. Which means it's designed for colder temperatures and harsher weather. Just Perfect for our UN predictable British weather. I love my new coat! It's so sleek and very stylish. I've never owned such a lovely coat. When I found out that I would be getting a Land's End coat I thought I would be keeping it for good/best wear but I must admit that I haven't left it off since it arrived. I've used every outing as an excuse to wear it. It's so lovely and warm and really does keep the cold winds out. I've teamed it up with a lovely scarf and so far I'm managing to stay nice and snug. No colds here. Land's End has a fantastic variety of all sorts of coat styles. There really is something for everyone. The Women's Coats are all beautiful whilst the Men's Coats are looking good too. I am so pleased with my new coat and have even had several compliments on it already. Of course I told them where they could get one too. If you're looking for a new coat this Christmas, why not check out Land's End and see if they have something perfect for you. I think the quality is superb and the prices are very reasonable for the high standard you get in return. 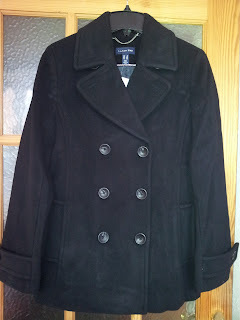 I'm very happy with my lovely wool coat and would definitely recommend them to my friends. Who knows, I may need a new summer coat next year.